FOP: 2 Perfectly ripe ready to eat, rich and creamy avocados / 2 Ripen at home to enjoy later, firm, fresh avocados. 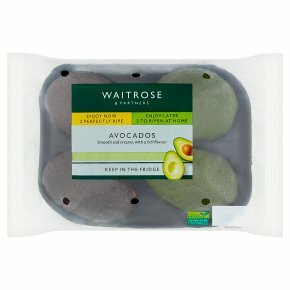 BOP: Waitrose Eat now eat later avocado pack. Two fruits ripened to perfection, ideally consumed within two days of purchase and two fruits to be ripened at home within 5 days.